Do you want to "warm-up" by learning the Lords Prayer in Hebrew? BONUS: CLICK HERE TO LEARN “THE LORD’S PRAYER” IN HEBREW! This innovative approach to learning the basics of biblical Hebrew can revolutionize your biblical studies and give you unprecedented access to the language, history, and context of the most important written text on earth! That’s enough for the introduction. Let’s get started! Oh, I almost forgot. In this first level of study we are going to be reading straight from the Hebrew text of the Book of Jonah. I created a very short video from ancient Joppa to give you a little visual context. Check it out! Are you already a registered member of the Academy and ready to try out Lesson 1? Click here scroll down and get started! If you are new to our site and are interested in going through lesson 1, we are asking that you register as a free member of the Academy. As a free registered member, you will have access to Lesson 1 to see if this course is for you. Also as a free member you will be able to download the PDF's of both the Introduction and Lesson 1. 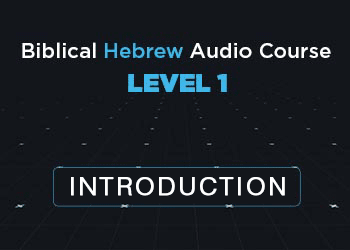 Register here in the ACADEMY to begin Lesson 1 of our new Biblical Hebrew Audio Course! Please give us some feedback on this Biblical Hebrew Audio Course in the comment section. I’m so excited I can’t hardly contain my excitement!!! 😉 Thank you BFA for all the time and hard work of putting such a project together like this. I’m so excited and I just can’t hide it! LOL ? The introduction pdf was a waste of time. There was only a short introduction. I would have liked to see or hear a sample of Jonah. I hope you will consider continuing with the course and you will get much more on Jonah. I am so totally lost. Once you begin the course things will make more sense. Just take one byte at a time :-). Feel free to ask questions as you progress. Where is the lesson? I see the words introduction, but there is no lesson. I have downloaded the pdf, but again. AYFO? Can the audio be down loaded yet? if so how? Thank you so much for all the work you do and for your wonderful presentations. Keith, I just read my first Hebrew sentence yesterday, thanks to you. May you be blessed in every aspect of your life and ministry! 1) At the end of the first lesson, you encouraged us to put our name in the sentence, but how do I say daughter of rather than son of. Is it bat as in bat mitzvah? And if that is correct, what does it look like in the script we are studying? 2) I want my own Hebrew text to study now. Which one do you recommend I buy? I am thrilled to have this course to study. I too would love a MP3 or iTunes version to help me study. I use an electronic tablet as my internet device. T raveling these past two weeks and grandchildren have slowed my personal study time however study will resume next week. Thank you so much for providing this opportunity this has been a prayerful request of mine for some time. What a blessing!!!!! Keith I have been waiting for something like this for a long time. You did an awesome job and I can’t wait for the next lesson. Thank you. Shalom Keith, Thanks i appreciate and I’ve shared this with my congregation, it has been my prayer that I polish up my Hebrew. Yehovah Bless! I’m excited about the course, but joining the cry for a downloadable (MP3) format for the audio lessons, please? You know our connection issues in the remote parts of the world..
Alternatively, could we order the full set of PDF and audio lessons by post? We are working on the downloadable audio. Hang in there with us! Had a very hard time following along with the PDF. In fact I went thru it three times and never was able to follow along with what you were say. Where did I loose it?? Thomas, thanks for trying this course. It is a process that will get much easier as we progress through the lessons. I promise. Thank you, Keith, for the devotion you poured into this. Would you be able to make these lessons downloadable, please. I find, that with my connection, the streaming files tend to get stuck and will only play for so long. If I download the file, It plays just fine. Thanks again. Just wanted to let you know Keith that I tried to open the Biblical Hebrew Audio Course and I keep getting a message that it is an UNSAFE WEBSITE. Don’t know what is going on. Anyone else had that problem? Carol, this seems to be an issue on your end with your browser. Try a different browser. I ann looking forward to getting you feedback! I just finished lesson 1. Lots of extra info I hadn’t learned through self-study. I found the study notes after a bit of searching. Giving kudos for putting this together-I know it is a big undertaking, but so rewarding to be able to search out the scriptures for yourself. Thanks & keep up the good work! I also can not locate lesson 1. My phone is a 635 not 636. I have a NOKIA 636 Windows 8 phone. Download Foxit Mobile PDF from the Windows Store and you should be able to read any PDF file. I like it a lot better than Adobe. I am also having a problem finding the Lesson PDF, I only see a one page introduction text. Also, the audio would be much more valuable to me if I could download it and take it with me on my long commutes in New York City. As it Is I am stuck sitting in front of a computer, because it does not play on my Windows Phone. Emmanuel are you a registered member of the Academy? Take a look here https://bfainternational.com/type/scripturebytes/ You will see the PDF’s for the Introduction and Lesson 1. Please let us know if you have any other issues.